The Collected Interior: Frugalicious Friday & a Giveaway...Purple Trail! Frugalicious Friday & a Giveaway...Purple Trail! Welcome to the 27th edition of Frugalicious Friday! Purple Trail is the only online service that gives you the tools to create fabulous personalized invitations, Ecards, Announcements, Photobooks and more! 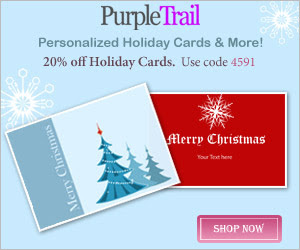 With Purple Trail sending personalized printed cards has never been easier. Create your own personalized invitations and cards in minutes. Then order professionally printed cards or print them at home. It's that easy! Never pay for Ad-free on-line invitations and eCards again! Purple Trail is the only online service that gives you stylish, ad free invitations and eCards for FREE...love that! Other services charge up to $5 each. 1. Select and customize your invitation design. 2. Enter event details and choose settings. 3. Send and manage your invitation. With Purple Trail you can even create personalized photo books! All you need to do is select a template, add your photos, then order or print at home! And for the Holidays...of course you can design beautiful and personalized Holiday cards! Thank You Cards, Congratulations Cards, Housewarming Party Cards, Reunion Invitations, Coctail Party Cards, BBQ Invites, Book Club Invitations, Girls Night Out Invites, Slumber Party Invites, Wine Party Invites...I'm tellin' ya, you name it they've got it at Purple Trail! For our giveaway today, Purple Trail is offering one Frugalicious Friday participant a free one year membership to their site! Yup, a whole year! How to win? Link up your fabulous finds, crafts and Diy projects and you are entered! As always, I'll announce the winner in my Frugalicious Friday Favorites post on Tuesday or Wednesday of next week! Okay my thrifty friends, link up and show us how you find fabulous! Thanks for the intro to Purple Trail...we do a lot of cards for Mr.CC's business and this would be great for us and also, I have been hosting lots of wedding showers for family and friends. Thanks for hosting! I can't wait to see everyone's projects! Hello sweet Jane - thank you for hosting this fun party! Thanks for hosting this great party again. I love all the frugal ideas and projects. Thanks for hosting this party. I always check in to see what creative projects are here. Great party you are having! I have been visiting some of the linkees. LOL! And they have some fabulous makeovers and designs. Love it! I'm really sorry, but the linky said mine didn't upload, so i did it again, and came to find it did it twice :( It's the Recycled Ladybug jar, can you delete one? Sorry! I really wanted to participate and include my cardboard tube giraffe, but the linky just won't let me. I think it's getting confused with cache and cookies, now it won't even pull up my thumbnails to select from. It's entering duplicates on some link parties, and not letting me post at all on others. :( I sure hope Brent fixes this soon! I'm thinking he should have beta tested this a LOT more before releasing it. I'm looking forward to mingling and learning a few things!